Maclocks Cling 2.0 Universal Tablet Security Stand is universal iPad lock and stand designed to work with all iPad models. It is compatible with variety of tablets having 7" to 13" screen size. Securing your tablet is a re-designed bracket clamp and stand base. The most notable update to the stand is now the mount base comes with 3M VHB adhesive as well as hidden screw holes. The Cling 2.0 bracket can still rotate between portrait and landscape mode and setup is quick and easy. 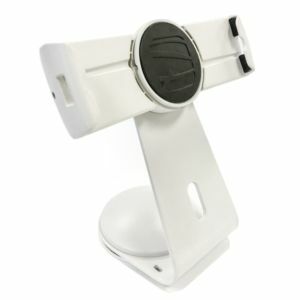 Buy Maclocks Cling 2.0 Universal Tablet Security Stand today!